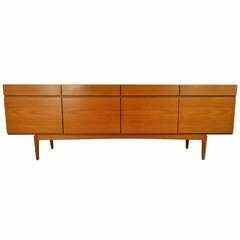 An outstanding Danish Modern teak tambour door long credenza with glass front hutch top designed by Ib Kofod-Larsen for Faarup Møbelfabrik. 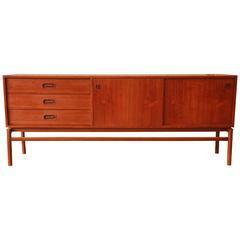 The credenza features stunning teak wood grain and sleek Danish design. It offers ample room for storage, with open shelving and four felt-lined drawers behind two long tambour doors. The hutch top has a glass front for display. The top can be removed and used separately as a low credenza or bookcase. The entire piece is finished on the back and could be used as a room divider. The original Faarup Møbelfabrik label is present. The credenza has been refinished and is in very good condition. The lower credenza measures 79.75" W x 19" D x 31.5" H, and the hutch top measures 59" W x 11.25" D x 25.25" H.
Newly refinished. Very good condition. 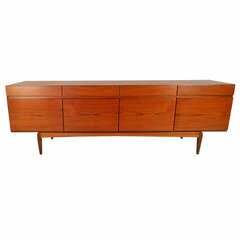 Midcentury large teak storage cabinet or credenza for the home or office by the Danish designer Ib Kofod-Larsen, Denmark, 1960. Teak veneered server designed by Ib Kofod Larsen for Faarup Møbelfabrik, Denmark, circa 1966. Please confirm item location (NY or NJ) with dealer.